Daughter of Naldi Donna L. Hill is a native Californian and lifelong film aficionada with a particular affection for films of the silent era. 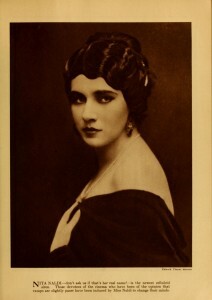 She is the webmistress of Falcon Lair, the Rudolph Valentino Home Page at www.rudolph-valentino.com and The Dorothy Gish Project at www.dorothy-gish.com. Her collection of rare Rudolph Valentino memorabilia and photographs is shared in her critically acclaimed 2010 book, Rudolph Valentino: The Silent Idol, His Life in Photographs. The author works in Intellectual Property and lives in San Francisco. Daughter of Naldi Joan Myers is also a native Californian and film buff. She studied British and Roman archaeology and medieval Welsh history at the University of Wales, Aberystwyth, and earned a B.A. in History from the University of California, Los Angeles. She resides in Los Angeles, California and is currently working on a new history of the Roscoe “Fatty” Arbuckle trials of 1921/1922. Daughter of Naldi Auxiliary Christopher S. Connelly is not a native Californian. This born-and-raised right-coaster earned dueling B.A.s (Theatre Arts and Radio/TV Communication) from Rutgers University. As a result, he works in IT by day and spends his nights singing in the Atlanta Opera Chorus (and elsewhere). In his copious spare time Christopher is completing a scholarly biography of stage and speak-easy legend Helen Morgan, although he himself spends little time sitting on pianos. His video essays and special materials grace Kino’s DVD release of Rouben Mamoulian’s Applause. First and foremost, we would like to thank Nita Naldi’s family, Lt Col (Ret) Daniel Smith, USAF, Karin Smith, and Lindsey Smith, for their remembrances of their Great-Aunt Nita and their help and support for this project. We would also like to thank Cris Alexander for sharing his memories of Nita and for allowing us to use one of his wonderful photos. This website is a reboot of the original Nita Naldi website done by Gloria Bowman, who provided us with her fabulous collection of photos, film stills, articles, and memorabilia for this new site. Daughter of Naldi Eve Golden graciously shared her Golden Images research on Nita with us. If the Daughters of Naldi had a group high sign, we would be high-signing Eve all over the place. The people named below are listed in alphabetical order, which in no way reflects upon the unstinting help they gave us, or their generosity in doing so. And it goes without saying: The Daughters of Naldi.